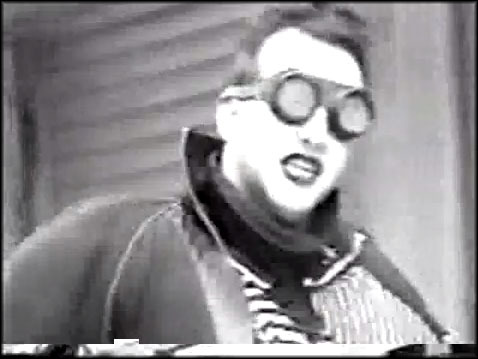 Let Poésie Noire transport you to a simpler time, when goths were GOTHS, and donning black lipstick ‘n’ goggles to shoot one’s darque synthpop music video in a desolate industrial setting wasn’t enough; only by dancing spasmodically atop slanting planks with newspaper stuffed down one’s pants could one convey true angst. The only thing that could potentially improve the “Tragedy” viewing experience would be inclusion of footage of lead singer Johan Casters (aka “La Bête Noire” – “The Black/Dark Beast”) actually “climb[ing] to ze top of ze tree” in that getup. But seriously, these wacky Belgians made some great tunes, blazing a trail alongside dark synth countrymen Front 242 and Neon Judgment. So good on ’em and their neo-Victorian inflatables! It took me a little bit to realize that he was *actually* saying “I climbed to ze top of ze tree” and you weren’t just making some sort of obscure innuendo. I love the guitarist’s begoggled mime look.